This Roasted Chicken is juicy, savory and delicious. It’s a classic family dinner staple that can be combined with most any side dish and salad. 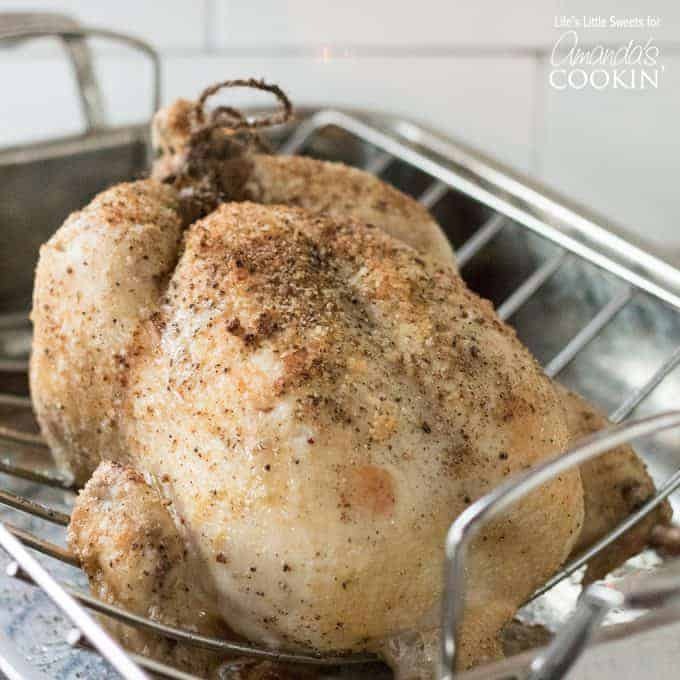 All you need is a whole fresh chicken, kosher salt, pepper and optionally any favorite herbs, garlic and or citrus to customize – it is that easy! Hi Everyone, it doesn’t get any more basic than Roasted Chicken, does it? 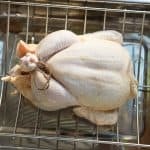 Everyone should know how to roast a chicken because it is one of the easiest, flexible, delicious dinners you can make. 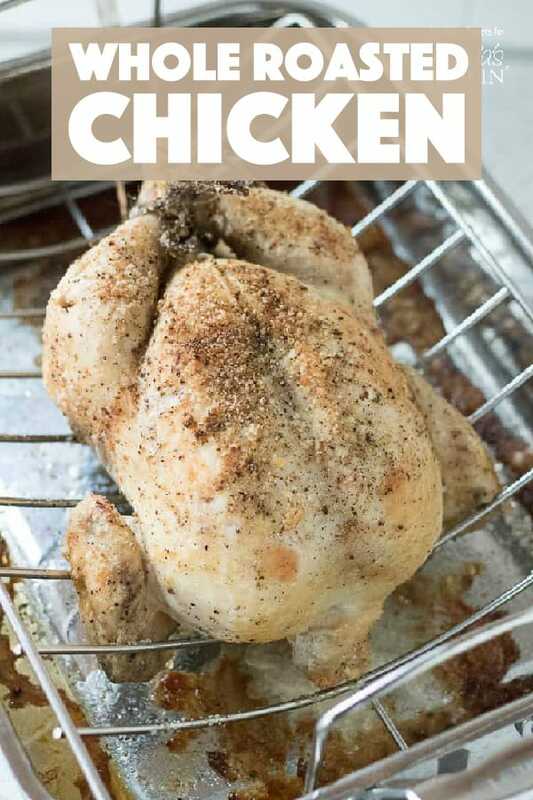 Guess what, it’s easier than you think and takes 1-1 1/2 hours to bake a whole chicken. Your kitchen will smell like the most amazing place on earth while it’s roasting! One of the fantastic things about a Roasted Chicken is that you can make a homemade gravy easily from the pan drippings and a bone broth from the carcass to use for chicken soup or another soup recipe. It’s really the gift that keeps giving. Delicious family meals over and over again that everyone will be happy to eat. There’s nothing more comforting than a good chicken dinner! 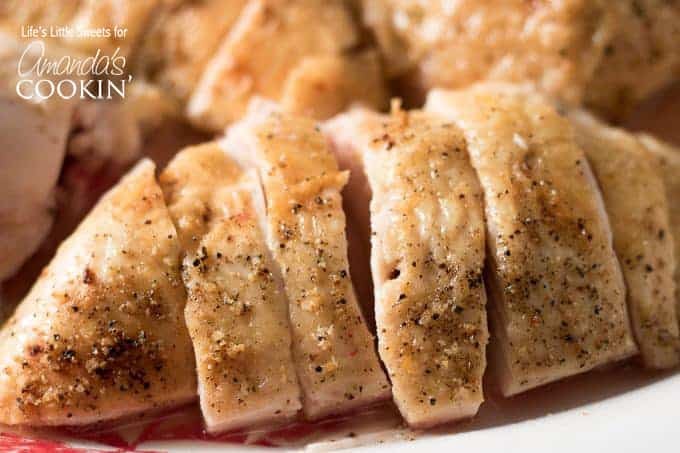 optional seasonings for inside the chicken cavity: garlic cloves, rosemary sprigs, thyme sprigs, lemon (halved) or get creative with your favorite seasonings! 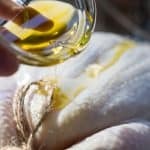 Making sure the skin is well patted dry with paper towels before applying the olive oil (or butter) will do wonders for making the skin crispy vs. if you did not dry the skin. 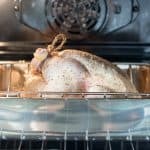 Make sure when roasting the chicken, keep the oven door closed. You can check it at 1 hour and if it needs more time, check it at 10 minute intervals from there up to 1 1/2 hours total roasting time. 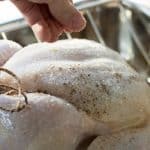 Using a meat thermometer, make sure that the chicken is at 165 degrees F, checking the deepest part of the thigh and breast before removing the Roasted Chicken from the oven. The juices should run clear. 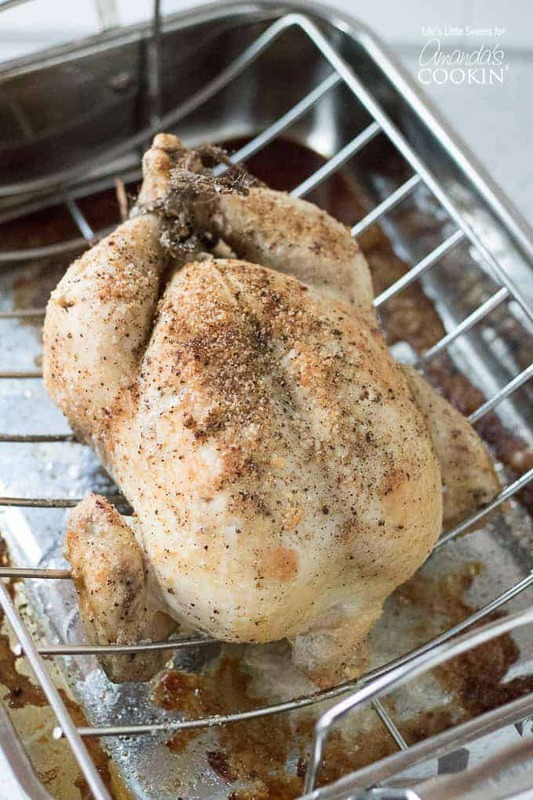 If you try this Roasted Chicken, let us know in the comments below! 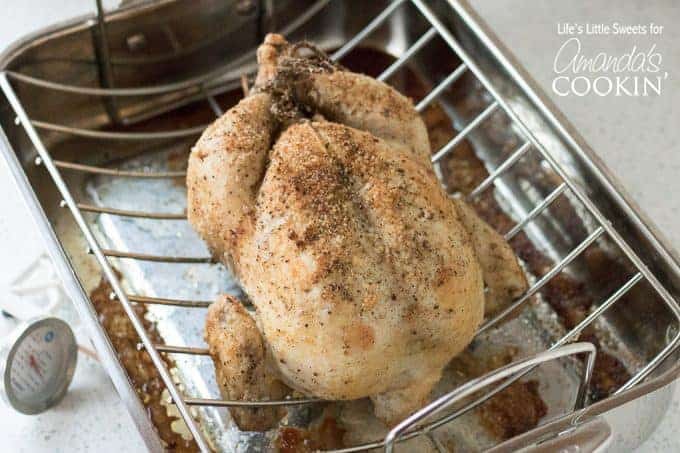 Be sure to serve this roasted chicken up with our favorite creamy traditional mashed potatoes or crockpot mashed potatoes and some slow cooker balsamic carrots. This Roasted Chicken is juicy, savory and delicious. It’s a classic family dinner staple that can be combined with most any side dish and salad. All you need is a whole fresh chicken, salt, pepper and optionally any favorite herbs, garlic and or citrus to customize – it is that easy! Remove the whole fresh chicken from it's packaging. 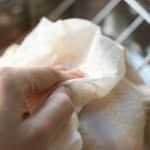 Using paper towels, pat the chicken completely dry. Place the chicken on the baking rack. Remove the bag containing the neck and giblets from the chicken cavity and either discard or save for making gravy. Using baking twine, tie the legs of the chicken together securely. This keeps the legs from overcooking. 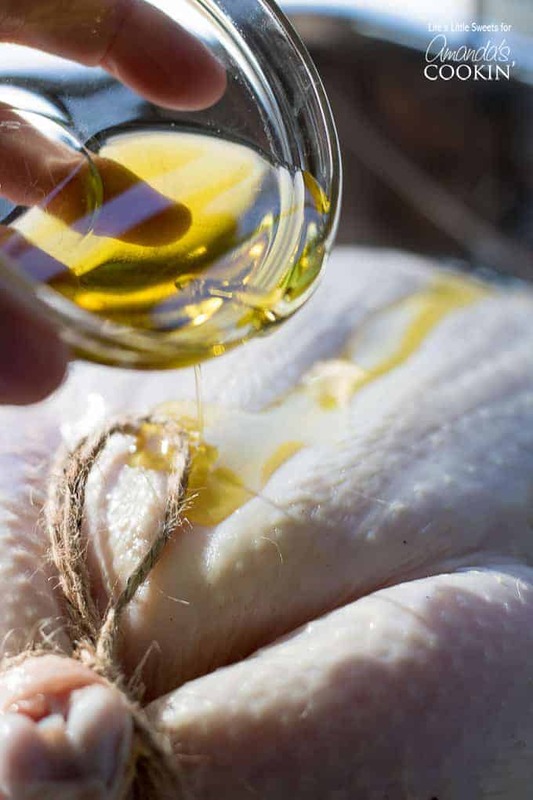 Rub olive oil all over the skin of the chicken. Tuck the wings of the chicken behind the back of the chicken. Sprinkle Kosher salt and fresh ground pepper all over the chicken. Make sure to salt the cavity of the chicken. Add any optional seasonings/ingredients to the chicken cavity. 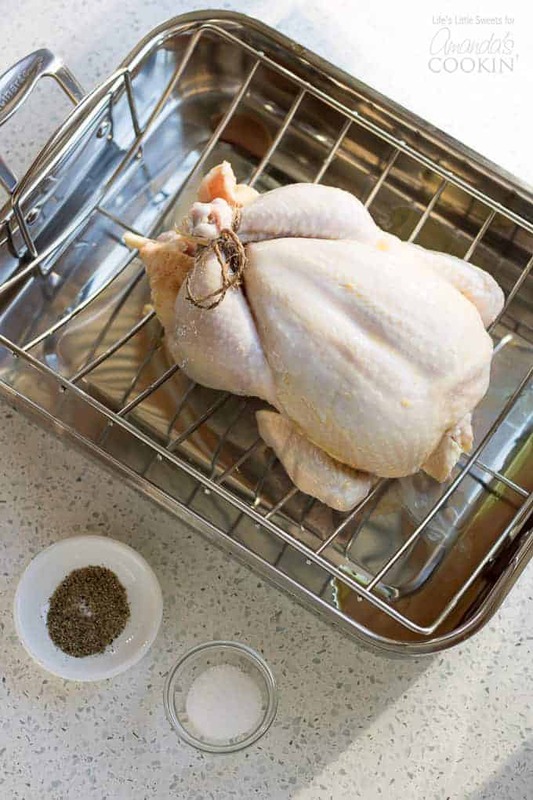 Roast the prepared chicken on the bottom rack, once you close the door, turn the heat down to 400 degrees F. At 1 hour check the chicken using a meat thermometer in the thickest part of the thigh and the thickest part of the breast, the temperature should be 165 degrees F before being considered done. If it needs more time, leave it roasting and check at 10 minutes intervals. The total time should be no more than 1 1 /2 hours. Time exact time when your chicken is done will depend on the size of the chicken. When it's done allow it to rest for 15 minutes before carving. The juices should run clear. 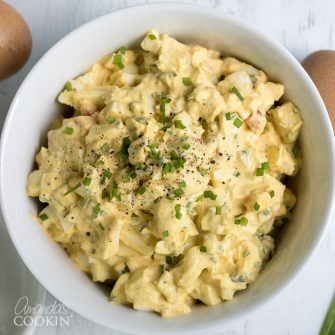 Serve with your favorite sides and enjoy! 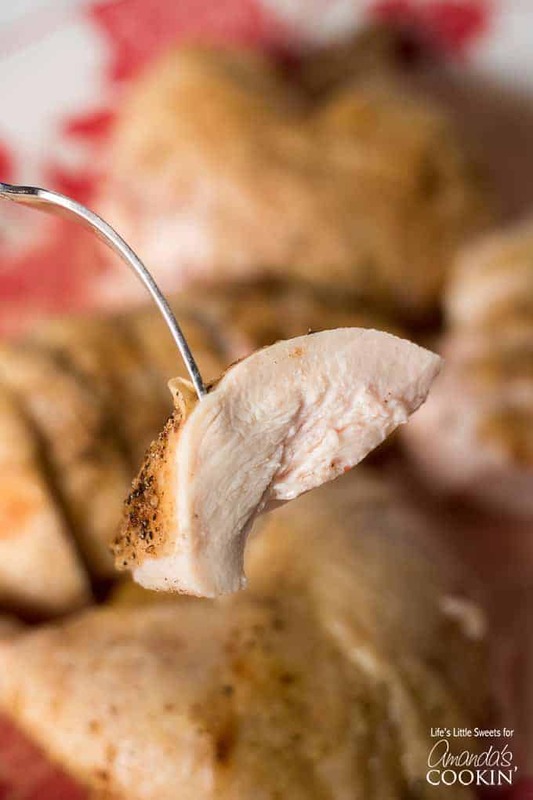 Using a meat thermometer, make sure that the chicken is at 165 degrees F, checking the deepest part of the thigh and breast before removing the Roasted Chicken from the oven. leftovers can be kept for up to 5 days in an airtight container and you can freeze up to 3 months.